Simple statement earrings with handmade hypoallergenic stainless steel wire and Swarovski rose pink colored hearts. 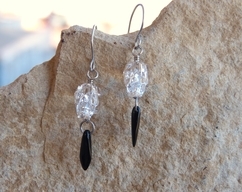 Heart crystals hang from a wire frame to create lots of movement and sparkle. Approximately 2 inches long.